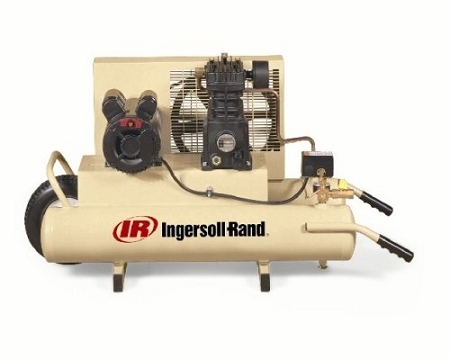 Ingersoll Rand's legendary air compressors provide unsurpassed performance in the most demanding applications. The electric wheel barrow compressor provides the classic performance of Ingersoll Rand to the contractor with long-lasting durability and hard-working features. Extended 2-year warranty on the pump with use of appropriate startup kit (see below). U.S.A. CFM at Max PSI: 5.7, Max. PSI: 135, Volts: 115, HP: 2, Air Tank Size (gal. ): 8, Tank Description: Twin horizontal, Pump: Cast iron, Portable or Stationary: Portable, Dimensions L x W x H (in. ): 43in. x 18in. x 25in.